Although Greek yogurt seems to be available everywhere you look, that wasn’t always the case. Fage, the company behind the top-selling Greek yogurt in Greece, began in Athens in 1926. Today, Fage sells dairy products in over 40 countries, using milk, cream, and live active cultures to create all natural yogurt, free of artificial sweeteners and preservatives. 1. IT ALL STARTED WITH A SMALL DAIRY SHOP IN ATHENS. In 1926, Athanassios Filippou’s family opened a dairy shop in Patisia, a neighborhood in central Athens, Greece. The shop became popular amongst locals for its rich, creamy yogurt. Almost three decades later, in 1954, Filippou’s son Ioannis joined the family business and helped create a national wholesale network for yogurt, distributing the dairy shop’s yogurt all over Greece. From the Greek imperative word Φάγε—English translation: Eat—Fage is often mispronounced by those unfamiliar with it. Φάγε is also an abbreviation, as the four letters in the Greek word stand for Filippou Adelphoi Galaktokomikes Epicheiriseis—translation: Filippou Brothers Dairy Company—after Filippou’s sons, Ioannis and Kyriakos. 3. FAGE WAS THE FIRST BRANDED YOGURT IN GREECE. In 1964, the Filippou brothers opened Fage’s first yogurt production plant in an Athens suburb. Over the next two decades, Fage continued to innovate. In 1975, Fage started selling containers of "Fage Total" branded yogurt to Greeks. Fage also expanded outside of Greece for the first time, exporting yogurt to the United Kingdom in 1983. In 1998, Costas Mastoras, the owner of a grocery store catering to Greek Americans, visited Fage in Greece to buy cheese to sell at his store in Astoria, Queens. Mastoras tried a sample of Fage’s strained yogurt and loved its thickness. After ensuring that he wouldn’t be breaking U.S. Department of Agriculture rules by importing the yogurt (since it contains live active cultures), Mastoras ordered 120 six-ounce yogurt containers and had them flown to New York. 5. … MAKING FAGE THE FIRST GREEK YOGURT EVER SOLD IN THE U.S. The yogurt sold so well at Mastoras’s store that Fage created Fage USA in 2000 to sell the yogurt more widely in the U.S. Americans who tried Fage didn’t mind paying a little more for the Greek yogurt, which is less watery than regular yogurt. Fage’s Total yogurt is strained—four pounds of milk are used to create one pound of yogurt—and the yogurt doesn’t contain the watery whey. 6. BESIDES GREEK YOGURT, FAGE ALSO PRODUCES CHEESE AND MILK. In the early 1990s, Fage started selling cheese and milk. Since 1991, Fage has produced cheeses like feta and gouda, but they’re not available in the U.S. Since 1993 in Greece, Fage has sold fresh milk that is pasteurized, homogenized, and packaged in its factories. 7. FAGE HAS A MASSIVE FACTORY IN UPSTATE NEW YORK. In 2008, Fage opened a U.S. production plant in Johnstown, New York. After a multi-million dollar expansion of the factory in 2014, the New York Fage factory has the capacity to produce 160,000 tons of yogurt annually. 8. WILLEM DAFOE NARRATED FAGE’S FIRST TELEVISED COMMERCIALS IN THE U.S. In 2011, Fage recruited actor Willem Dafoe, a.k.a. Green Goblin in the Spider-Man trilogy, to narrate televised commercials. Chef Bobby Flay has also done ads for the brand. More recent UK commercials for the Fage Total split cups (which have yogurt plus a separate compartment of a sweet mix-in like strawberry, honey, peach, cherry, key lime, blood orange, or raspberry pomegranate) feature a female narrator. 9. FAGE’S HEADQUARTERS ARE NO LONGER IN GREECE. 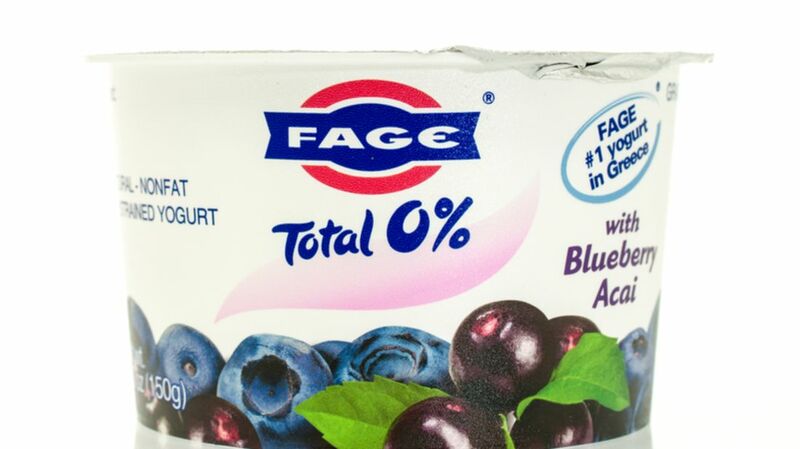 The financial crisis in Greece greatly impacted Fage. In 2012, Fage executives decided to move the company’s headquarters from Greece to Luxembourg to avoid Greece’s instability and depressed economy. Although Fage isn’t headquartered in Greece anymore, the company retains its authentic Greek heritage by continuing to own and operate yogurt, milk, and cheese factories in its home country. 10. FAGE WAS SUED FOR NOT BEING “GREEK” ENOUGH. In 2014, two men in New York sued Fage (and Chobani, another Greek Yogurt company) for deceiving customers. In a class action lawsuit, Barry Stoltz and Allan Chang accused Fage of misleading customers into thinking that 0 percent yogurt means it has no sugar (the 0 percent refers to the milk fat) and of tricking customers into thinking that Fage is made in Greece when it’s really made in the U.S. The lawsuit is ongoing, but lawyers for Fage are working to get the lawsuit dismissed. 11. DESPITE ITS INTERNATIONAL GROWTH, FAGE REMAINS A FAMILY BUSINESS. Fage’s parent company, Fage International S.A., is still completely owned and led by the Filippou family. In 2006, Athanassios Filippou’s grandchildren joined the company, continuing the Greek yogurt family business.